the technique may only be used at sites with a high potential for re-invasion, when other control methods have proven insufficient (i.e. have been tried and been found to be insufficiently effective). Because of the risks associated with the use of anti-coagulant rodenticides an Environmental Risk Assessment (ERA) should be carried out prior to any application of these products. This will determine which possible adverse environmental effects may occur at any specific site and allows the identification of the measures necessary to protect wildlife and the wider environment in as far as is possible. 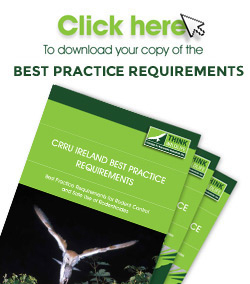 To facilitate PMUs in conducting Environmental Risk Assessments, CRRU Ireland has developed and updated an Environment Risk Assessment Form and associated Advisory Notes. Both documents are available for download on the resources page.